Taste test: These are really good chips, with lots of nice, smokey barbecue flavor. 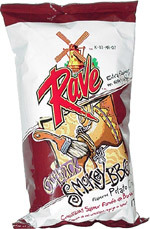 The chips are dark from all of the flavor powder, and the large unbroken ones near the top of the bag were very impressive-looking. Some people were see near the chip bowl seen eating several chips, stacked together, all at once. The chips leave behind a ton of flavor powder on your fingers, which you could either wipe off with a napkin or save for a finger-licking secondary snack. Smell test: Really nice rich, smokey barbecue aroma.